On Friday evening at 7pm we kicked-off the Trójmiasto Startup Weekend. As you could read in my previous post this weekend is part of the Global Startup Battle, aiming to start 1200 new startups. In total 18 ideas were shared on Friday evening. The 40 participants chose 8 and teams were formed. When I arrived on Saturday morning I learned two teams had joined efforts. The 7 remaining teams have been working really hard. Today at 5pm all the teams were pitching their idea. The bottom line conclusion is this weekend only knows winners! Everybody did an amazing job. On Friday evening we started with some excercise. After being divided in several groups, every group had to come up with a startup idea, company name, logo and pitch in a very short period of time. All 6 ideas were amazingly great. It made the group feel confident they should be able to repeat this in the upcoming two days. On stage 18 ideas were presented by different idea-owners, among them really nice ones. After voting 8 ideas remained. Teams were formed around these ideas. Idea-owners were requesting for additional resources. The demand for developers, especially mobile developers, was high. Also UX designers were badly needed. Around 10pm it was high time for the teams to get started. Less than two days were remaining for thinking out the right business model, customer validation and the execution resulting into a MVP (minimum viable product). Both on Saturday and Sunday for several hours a group of coaches showed up. These are all entrepreneurs with a lot of expertise from the region. The teams were using this knowledge a lot and in some cases it might have caused to much chaos. Many ideas, suggestions and opinions have been exchanged. The teams had to decide themselves what to use. Already on Saturday, but even more on Sunday, the first results were visible. Unfortunately, it appeared that several teams didn’t leave the building for the customer validation. The teams who did learned a lot. It was really impressive to see the results. Seeing all the great results this weekend knows only winners. The outcome of just two days of work is impressive. All teams were able to pitch their ideas in front of the jury. The teams did a good job, but did they convince the jury as well? The best pitch award went to LetsDeliver, because they were extremely enthusiastic and using a lot of media. Besides, they delivered pizza to the jury. The audience chose their favorite presentation which got the People’s Choice Award and a lot of additional prices. This award was won by team Meetraveler. The Overall Winner of the weekend, including great prices like a trip to Malta, etc. was Virtual Recruiter, because the jury concluded the potential seems even bigger than the team seemed to realize. I can really support this conclusion. On Saturday we already discussed the potential future business model behind this idea. It’s massive! Congratulations to the very enthusiastic team. @LetsDeliver: Let’s just call it the taxi for food delivery. If you order a pizza, you want to have it quick. The restaurant owner should focus on preparing great food. Specialised food drivers can take care of the delivery in the most efficient way by means of the LetsDeliver platform. TV Killer: It’s the TV Killer for kids. Interactive tablet books make your kids don’t want to watch TV anymore. A user friendly interface should enable quick conversion of books to digital apps. @RecruiterHelp: The Virtual Recruiter will support every applicant to get well prepared before a job interview. You will be ready to answer the hardest questions. You will be able to take a video of yourself while being interviewed by the Virtual Recruiter. When you are satisfied you can send your video to an advisor for feedback. As an employer I already realize how much precious time this might save us in case the candidate would use the video to apply! @Respondrr: E-mail is becoming increasingly a pain for all of us. The majority of messages can wait, but there are such messages which cannot. Anyhow, you are not always able to instantly answer them, although senders increasingly expect this. Respondrr is the clever auto-responder that will instantly reply to your sender what response time he should expect. @Meetravel: While traveling, attending events or looking for the right pub to spend your evening it could be great to have an unexpected valuable meeting with like minded people. But how and where to find them? The solution was presented today after an enormous pivot the team made last night. Eventification: Corporate events are in general rather formal, may be even boring. People attend some lectures, meet with some people and that’s basically it. But it could be so much more fun with some gamification. Service4Service: In times of crisis people have to spend less, they are jobless, but still need services and have services to offer. The barter economy could partly be created with Service4Service, a community based, secure service exchange platform. 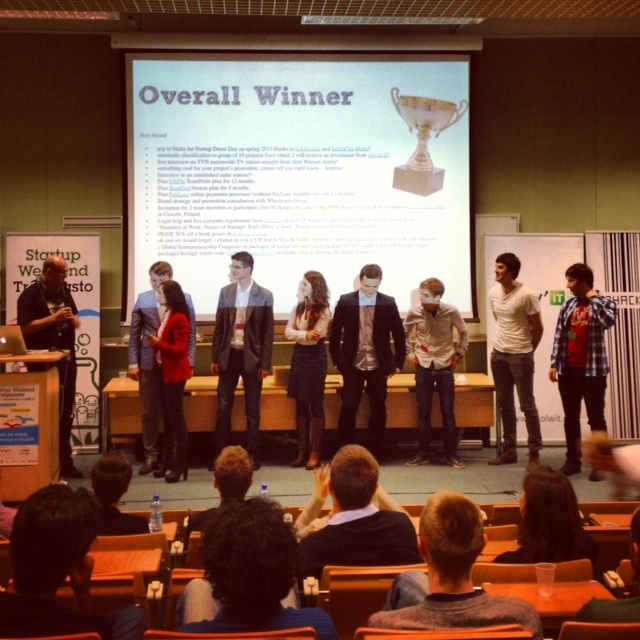 After a bit more than two days we can conclude the second Startup Weekend in Trójmiasto was very successful again. Great ideas have turned into nice solutions. Some of them really might have a lot of potential. But of course, the future will tell. Personally, I really liked to observe these teams cooperating in delivering amazing solutions. Creativity, knowledge, experience combined with engagement and a lot of effort paid off! It was fun joining this great event.